Megabol Plasmex Blood Amino is amino acids hydrolisate achieved from plasma globin of animal blood is an active matter. Plasma globin is the last amino acid raw material, next one after hydrolisates of milk proteins (whey). Hydrolisate means proteins processed by enzyme reactions. Envolved in this way short bonds of amino acids, hierin di- and tripeptides are characterized by an anabolic effect achieved from production of somatomedin C in liver. Such process fasten muscle mass building. Some of the peptides can stimulate also production of hormone growth. Plasmex Blood Amino is an ideal supplement during the time of increased forcible efforts but also during the training breaks or plans for make fat reduction. Than it is like anti-catabolic protection for expanded muscular tissue. 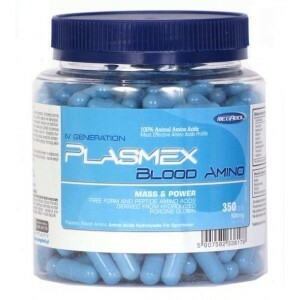 Plasmex Blood Amino is: - Fourth (the last) generation amino acids supplement - hydrolyzed plasma globin - in 100% active substance - fast growth of muscle mass - protection of muscles against fall during the breaks or reduction. 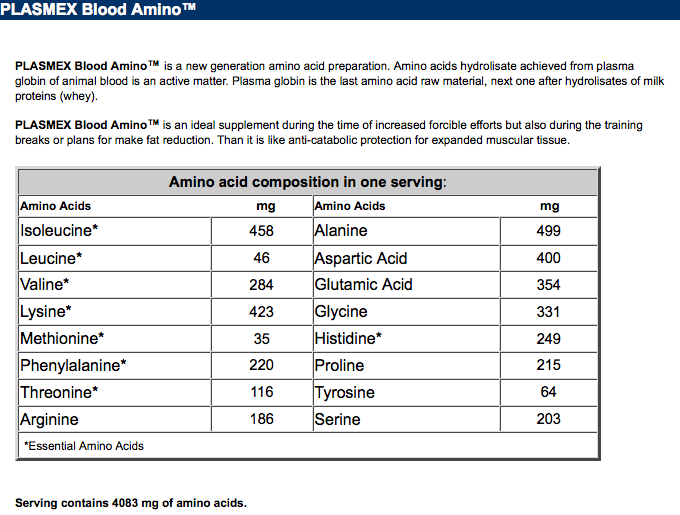 A new generation amino acid supplements. Consume 1-2 portions per day. Portions should be consumed before morning meal, after the training or before any other meal in non-training days. One portion = 10 capsules.